The white membrane under the skin (called the pith) or more correctly the albedo, contains almost as much vitamin C as the flesh of the fruit? The white stuff is also a good source of pectin- a soluable fiber that helps lower cholesterol levels. 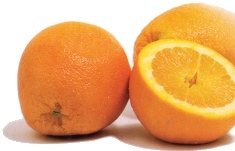 Oranges also contain vitamin C, potassium, calcium as well as the b vitamins niacin and thiamine. Read our article about the two different types of citrus juice, and guide on selecting the right citrus juicer for you. Looking for the Orange X Juicer?? The OrangeX juicer name has been changed to the Jupiter for the Mid Size model and the Olympus for the Large (Commercial) Model. This was the decision of the manufacturer to phase out the OrangeX name, probably so they would no longer have to pay royalties. Manual Juicers- These machines need no electricty to operate..